Saturday will be Purdue's last chance to beat a good opponent this season and earn that annual Spoilermaker upset. And while Penn State is looking like a very good team after a rough start to the season, there's nothing to spoil for the Nittany Lions, since they won't be playing in a postseason for a few more years. What's at stake for Purdue? A chance to finally right the ship that has been sinking for the last four weeks, and a critical win to try and get bowl eligible. The fans rejoiced when it was announced Robert Marve would be the starter on Saturday. He's been the team's most efficient quarterback and seems to get the most from the guys on the field thanks to his strong leadership and winning demeanor. Those don't necessarily result in points, but the team has the chance to really make a statement with a win behind their injured quarterback. With Marve, I don't know if we'll see the Boilers score on their first drive, like we've become accustomed, but I also don't think we'll see the offense fall asleep for series after series. If the defense can get to the passer, the Boilers have a good shot to shut down the Penn State offense, who don't have that great of a running game. That's a big "if" though since sometimes the D-line shows up, and other weeks they don't. The talent's there, so hopefully they can rally and cause some havoc. I'd say home field advantage is a big plus for Purdue (and no one wants to play in Happy Valley), but I'm not sure if that will matter the way the fans have (rightfully) bailed on spending money to see this team play. Hopefully the season ticket holders will show up loud and energetic. Quarterback Matt McGloin has looked better and better each week, and he's making the Lion offense a potent attack. After the way Minnesota freshman Philip Nelson made the Boiler secondary look last week, McGloin could dominate. The Penn State defense is one of the toughest in the conference, so they could very easily shut Purdue's offense down. Their pass rush is adept at sacking the quarterback, and with Marve not as fleet of foot as before his injury, the Boilers could get forced into a lot of deep-passing situations. That makes things ripe for turnovers, and the Lions should win that battle and walk away with some free points. Maybe I'm in a mean mood, but there are just too many Nittany Lions to laugh about this week (and that's working with a transfer-depleted roster)! First, let's just sit back and feast our eyes on these two offensive linemen (get it?!). I'm not even going to tell you their names, since it's not their fault, poor guys. If they get much playing time, our pass rush may be laughing too hard to attempt to get to the quarterback. Then we have tight end Matt Lehman. I've seen plenty of fauxhawks, but this might be the thickest and most awkward looking. Maybe his head is just really pointy and he's trying to cover it up? I'd criticize him for looking like a d-bag, but the dude's already married as an undergrad, so maybe his wife made him do it. Finally, we have linebacker TJ Rhattigan, who was VERY excited for picture day. Fortunately for Purdue, he's not as physically imposing as his namesake. He actually looks a little like a younger, friendlier Henry Rollins (and Rollins would likely knock every Boiler on the field unconscious in a fit of rage). I'm losing badly, so now you all know why I don't actually gamble on sports. Just wait until you see how poorly I do this basketball season with our predictions! This week Erik and I are betting how much we spent on our most recent (or favorite recent) Halloween costume. Since I have two young daughters, Halloween is spent getting THEM into costumes, so I tend to rock something I can put together on the fly for free. One year I wrapped myself in six-foot okra plants, Swiss chard, and green onions and went as my garden. It was ridiculous, but I was pretty proud. My favorite recent costume was back when my wife was pregnant. We rocked the Juno couples costume, and I made an excellent Paulie Bleeker, complete with yellow sweatbands and the official Dancing Elk Condors gym shirt. I had to purchase the t-shirt online and the yellow shorts and sweatbands at some local stores, so unfortunately the entire ensemble set me back about $45, but I still wear all the items pretty regularly (individually of course, I can't be Bleeker every day). Hopefully this will help me catch back up to Erik if I bet wisely this week (I'm behind by $57). Erik's disturbing me a bit. 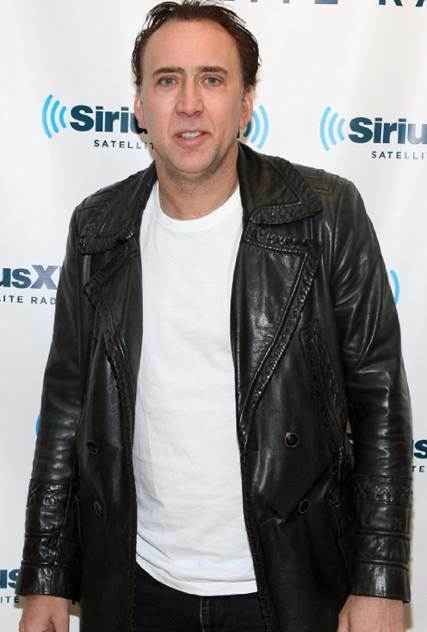 This year he dressed as Nicolas Cage for Halloween. He did it using the "stylish" Cage-esque apparel he already owns and slicked back his hair with some cheap soap. Since "free" doesn't count this week, if he had done the costume more accurately, he would have purchase some nasty jeans, white undershirt, and black leather jacket from a thrift store for about $13 (a very Halloween appropriate number) to look like this stud. I'm sure his wife was thrilled. 1. Can you believe this is Robert Marve's first conference start? That makes me sad, not only for Marve, who deserved better if his ligaments would have held out, but also for how messed up these last few years of quarterbacking have been. 2. If you're going to the game, remember it's Military Appreciation Day. There will be a cool fly over, American flags will replace the conference team pennants around the rim of the stadium, and there will be some National Guard Humvees by the stadium for fans to check out. You can also purchase an "I Am an American: We Support our Troops" camo t-shirt or hat at the stadium. That disturbing costume won my office's costume contest thank you very much! Now put the bunny back in the box.